…and much more, including difficult cases. Using a laser scanner, the 3D BodyView™ creates a computerized 3-dimensional model of your feet. It maps the soles of the feet in detail, comparing your feet to an ideal model. From here, the system gives both you and the doctor a detailed visualization of the arches of your feet as well as overall body balance. The system also offers the ability to order custom stabilizing orthotics directly from the scan of your feet. Unlike generic, over-the-counter orthotics, these orthotics are individually designed for your unique postural problems, not just problems with your feet. By correcting imbalances in your feet, spinal and pelvic misalignments can be lessened. Stabilizing orthotics offer more than just short-term symptom relief. They promote whole-body wellness for your life. 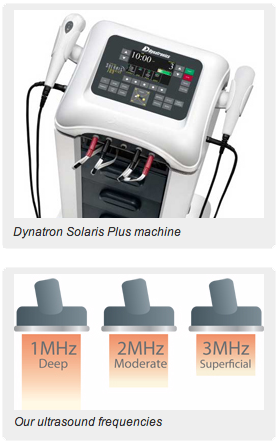 The first of its kind, the revolutionary Dynatron® ThermoStim™ Probe combines cold or heat with muscle stimulation and soft-tissue mobilization. By targeting the exact areas in need of treatment, this muscle stimulation system increases muscle strength and promotes blood supply to the treated areas. 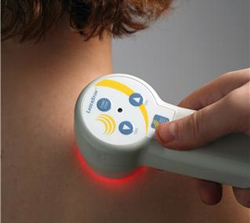 We use the Dynatron® ThermoStim™ method to treat a wide variety of conditions, including pain and inflammation, and to enhance patient outcomes in much less time than would otherwise be necessary. 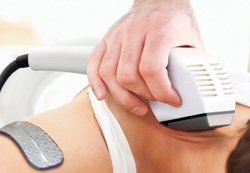 At NJ Spine & Joint, we use the only ultrasound devices in the industry that offer 1, 2, and 3 MHz frequencies for the greatest flexibility in depth of treatment, so we can customize your treatment to your unique health issues. Ultrasound therapy has many benefits, including speeding up your body’s natural healing process by increasing blood flow to the ultrasound-treated area. Our device’s heat-producing sound waves work to relax muscles, joints, and tendons. Many patients experience a decrease in pain to treated areas, due to a reduction of swelling and inflammation. The ultrasound system’s flexibility allows us to provide treatment for your condition with the highest level of customization available. 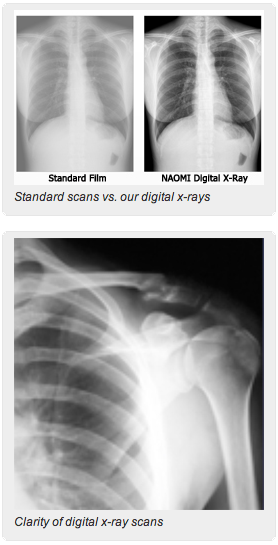 We use the safest and most advanced x-ray system available–the NAOMI digital x-ray system. The NAOMI system converts our x-ray images into digital data and displays it on a monitor. This is a fully digital system, which maximizes the advantages of a digital radiography, including increased sensitivity and speed, while decreasing the need for retakes. NAOMI digital x-rays use 192 high-speed cameras with extremely high sensitivity, so we can produce clear and vivid images of your problem while using the lowest possible dose of radiation. And when we examine your NAOMI x-ray images, we are able to see detail that we would never be able to view on conventional x-ray films. Unlike conventional x-ray imaging systems that emit high levels of radiation, the digital NAOMI system x-rays nearly never need to be retaken, resulting faster and safer usage for our patients.